After trying the Red Actually shade from this range, review here, I decided to see what else was in the range. 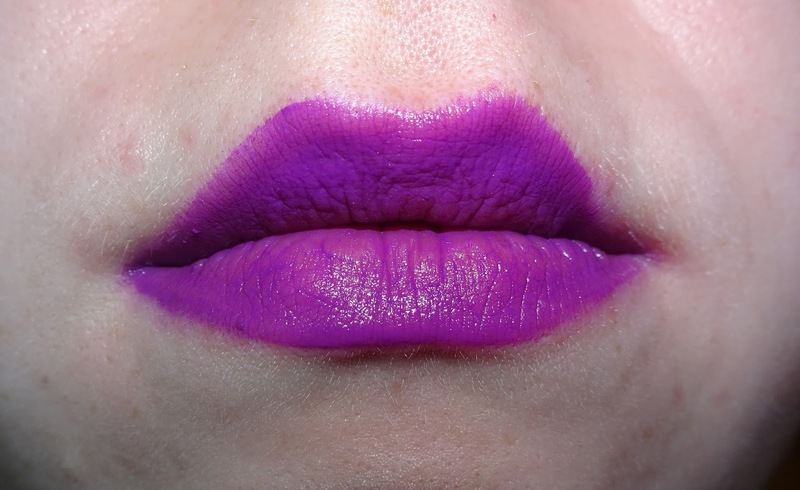 I have wanted to branch out and have more brighter lip options for a while but I have never been sure what I want to try, but when I saw this purple shade I thought it might be quite pretty to give a go. 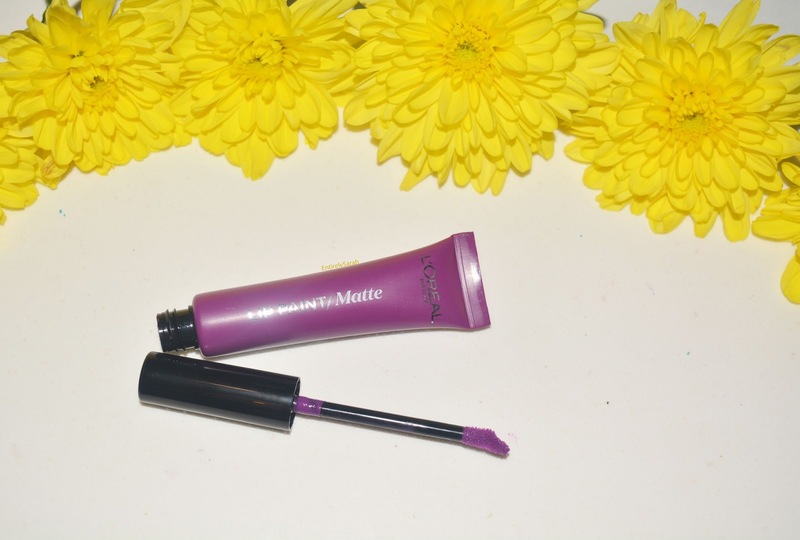 I also thought it would be a nice bright shade for summer, but the purple hue would transition into autumn nicely as the weather begins too cool down before I pull out a full berry lip. 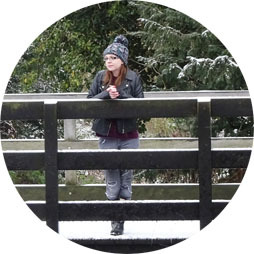 The lip paint comes in a toothpaste style tube which is colour coordinated to the product inside. In this case the packaging is purple as the lip colour is purple. I really like the idea of this as when I am rooting around in my beauty drawers it can be a real pain to find the shades I am looking for if they don't have the colours on them. The doe foot applicator is easy to use and picks up a really good amount of product without being too much or having to go back into the tube several times for more product. The purple shade is a lovely true purple which isn't too deep or too pink toned. The shade has a really lovely opaque finish, it can be sheered out a little with the doe foot applicator if it doesn't have a lot of product on the wand, but it is opaque on me when the wand has the normal amount of product on. The product has a lovely creamy formula and it feels and looks really lovely on the lips. I wasn't sure how I would feel about the colour as I haven't ever wore one like this and so I was unsure if it would suit me, however the shade is a beautiful and really did look just as nice on the lips as I hoped. 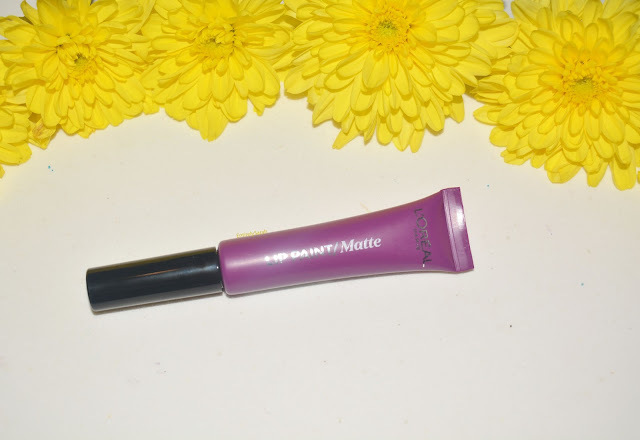 I find the formula to be really comfortable and feel nice on the lips, however, the formula is marketed as a matte lip paint, and I have to be totally honest, it does not dry down to a matte finish. The colour lasts really well on the lips, but due to it not being a full matte finish it does still transfer and so taking away from the longevity if you are eating, drinking or anything like that. Overall I really do like this purple lip colour, I wasn't sure how much wear I would get from it, and to be honest with you all, I am not sure I feel confident enough yet to actually wear it a lot, but I do think it is a really lovely shade and one I have enjoyed testing out and will definitely be wearing more often in the future. At £6.99 they are a good price and this shade is on Superdrug here, but I will say if you are hoping for a matte finish, you aren't going to get what you are expecting as these don't fully dry down. If you have tried these do let me know in the comments, as I would love to try more shades, also let me know your favourite matte lip product as I am looking to try more all the time!